Autumn leaves, apple cider, candy corn and Halloween are the makings of a festive fall season. Spice up your Halloween by taking part in the Charleston Ghost and Graveyard Walking Tour. 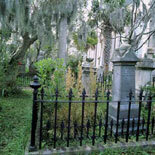 You will have the opportunity to walk through this historic graveyard, one of the oldest in Charleston, and catch a glimpse of some history by reading the gravestones. Your experienced tour guide will tell you about the lives of those whose final resting place lies within the gates of the Holy City. You will not want to miss this unique after-dark experience. Don’t forget your camera – you might be able to catch the image of a ghost! When you buy your tickets, a portion of the funds will go to benefit the restoration and preservation of The Old Exchange, one of the country’s most historical buildings. Some proceeds will also benefit other historical buildings found in the city. The tours operate nightly from 7:30 PM to 9:30 PM. Make sure you purchase your tickets at least 24 hours in advance to save your spot on this “spook”tacular adventure. The tour covers a distance of 3/4 of a mile so make sure you wear your walking shoes. The tours are conducted rain or shine; check the forecast and be prepared for inclement weather. Gather your family and take part in this ghostly tour, loaded with adventure, history, and tales of love and loss. You won’t want to miss this opportunity to enjoy the crisp, autumn air while touring the graveyard.